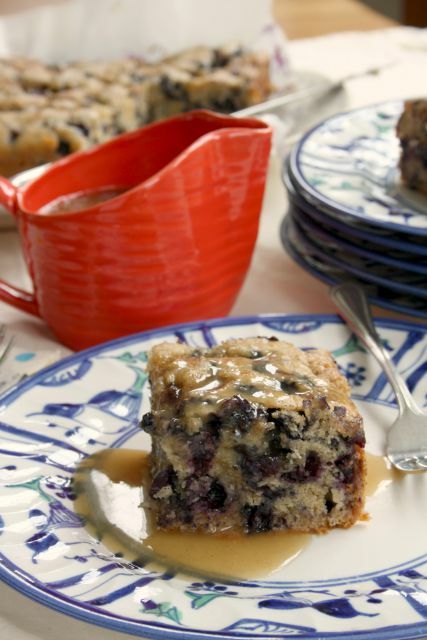 Blueberry Bliss is an old fashioned blueberry crumb cake. The cake on its own is almost like a coffee cake but you can dress it up with the brown sugar sauce. When I was little we had a 22 cubic foot freezer in the basement. It was the size of a small car and by the end of the summer it would be starting to fill up again with summer fruit. There would be bags of rhubarb, strawberries and raspberries but it was blueberries that mom froze in great amounts. Before you could buy five and 10 pound boxes of blueberries at local markets mom would buy her blueberries for the year from a Mr. Ness in Belleisle Creek. She and dad would load the car with pots, Dutch ovens and roasting pans to be filled with berries and Mr. Ness would fill them from huge crates in the back of his truck. Mom has been making this recipe for Blueberry Bliss since the late 90’s. The cake on its own is almost like a coffee cake but you can dress it up with the brown sugar sauce. It’s a great party recipe since it makes a 9”x13” pan. Preheat the oven to 350 F and line a 9”x13” pan with parchment paper or grease and flour it. In a large bowl beat sugar and eggs. Heat milk with butter just until the butter melts (don’t boil). Cool slightly then add to the sugar mixture. In another bowl combine flour and baking powder. Gently stir into the sugar milk mixture. 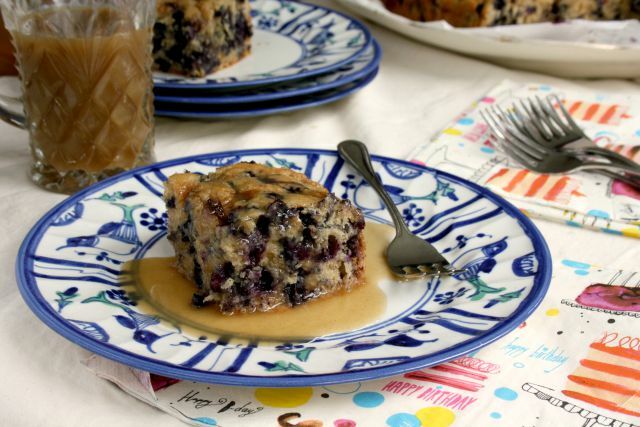 Fold in blueberries and scrape into prepared pan. Combine topping ingredients and sprinkle over cake batter. In a medium pot combine sugar, flour and salt. Add boiling water and cook until slightly thickened. Remove from heat and stir in butter and vanilla. Drizzle sauce over individual pieces of cake before serving.